Flaring, active regions of our sun are highlighted in this new image combining observations from several telescopes. High-energy X-rays from NASA’s Nuclear Spectroscopic Telescope Array (NuSTAR) are shown in blue; low-energy X-rays from Japan’s Hinode spacecraft are green; and extreme ultraviolet light from NASA’s Solar Dynamics Observatory (SDO) is yellow and red. 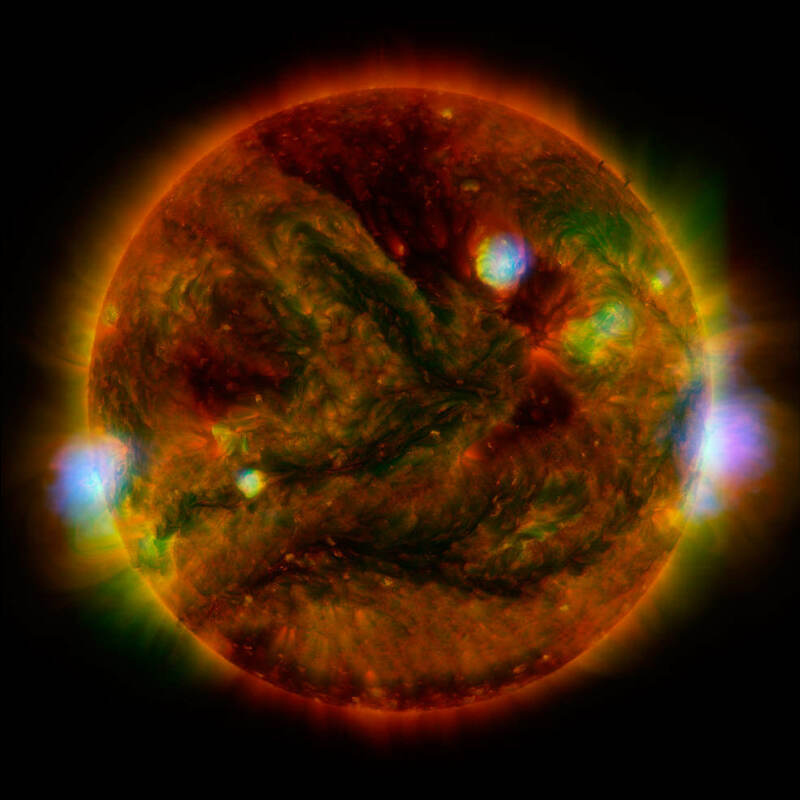 X-rays light up the surface of our sun in a bouquet of colors in this new image containing data from NASA’s Nuclear Spectroscopic Telescope Array, or NuSTAR. The high-energy X-rays seen by NuSTAR are shown in blue, while green represents lower-energy X-rays from the X-ray Telescope instrument on the Hinode spacecraft, named after the Japanese word for sunrise. The yellow and red colors show ultraviolet light from NASA’s Solar Dynamics Observatory. NuSTAR usually spends its time investigating the mysteries of black holes, supernovae, and other high-energy objects in space. But it can also look closer to home to study our sun. NuSTAR may also be able to directly detect hypothesized nanoflares, which would be only one-billionth the energy of flares. Nanoflares — which may help explain why the sun’s atmosphere, or corona, is much hotter than expected — would be hard to spot due to their small size. However, nanoflares may emit high-energy X-rays that NuSTAR has the sensitivity to detect. Astronomers suspect that these tiny flares, like their larger brethren, can send electrons flying at tremendous velocities. As the electrons zip around, they give off high-energy X-rays. “We still need the sun to quiet down more over the next few years to have the ability to detect these events,” said Hannah, explaining that, while our sun is approaching the tranquil end of its roughly 11-year activity cycle, it has been showing spurious bouts of high activity. Cosmologists are looking forward to using NuSTAR’s solar observations, too. There is a slim chance the telescope could detect a hypothesized dark matter particle called the axion. Dark matter is a mysterious substance in our universe that is about five times more abundant than the regular matter that makes up everyday objects and anything that gives off light. NuSTAR might be able to address this and other mysteries of the sun. NuSTAR is a Small Explorer mission led by Caltech and managed by NASA’s Jet Propulsion Laboratory in Pasadena, California, for NASA’s Science Mission Directorate in Washington. NuSTAR was developed in partnership with the Danish Technical University and the Italian Space Agency (ASI). The spacecraft was built by Orbital Sciences Corp., Dulles, Virginia. NuSTAR’s mission operations center is at UC Berkeley, and the official data archive is at NASA’s High Energy Astrophysics Science Archive Research Center. ASI provides the mission’s ground station and a mirror archive. JPL is managed by Caltech for NASA.